Eight years ago. Al Gore released “An Inconvenient Truth,” the book and documentary film that laid out the scientific consensus connecting the burning of fossil fuels to climate change. At the time, the former vice-president challenged the fossil-fuel industry and all of us who depend upon its dirty output to face up to what may be the most difficult economic, scientific, and moral challenge the global community will ever face. Gore’s articulation of the long-term, developing climate catastrophe was a shocking prediction that’s proved to be all too true. But there’s some good news, too. Since throwing out those first frightening and potentially life-altering salvos, Gore has been an easy target for climate-change deniers. Their response to Gore’s brilliant cataloguing of the case for human activity and climate change was swift and ugly. Some clever right-wing wordsmith coined the word “schlockumentary” to mock and vilify the movie and the man. The book was dismissed as science fiction by congressional conservatives and lobbyists for the oil, gas, and coal industries. The immediate, vociferous response to Gore’s science lesson demonstrated the truth of the old maxim that blaming the bearer of bad news is always easier than confronting the bad news itself. Unfortunately, the bad news has only gotten worse. Since 1988, when the world passed the upper safety limit for atmospheric CO2—350 ppm (parts per million)—the levels of CO2 in the atmosphere have been steadily rising. This past June, CO2 measured by the Mauna Loa Observatory reached 401.30 ppm, a level of carbon dioxide in the atmosphere that is the highest CO2 concentration in human history. The effects of those increased levels of CO2 in our fragile atmosphere are becoming ever more dramatic, more visible, and more difficult to dismiss. May 2014 was the warmest May in more than 130 years of recorded global temperatures. Rising global temperatures are speeding the melting of glaciers and ice caps. The polar ice cap is melting at a rate of 9% per decade. The thickness of Arctic ice has decreased 40% since the 1960s, and it’s estimated that, if the current rate of global warming continues, the Arctic could be ice-free by 2040. Over the last three decades more than one million square miles of perennial sea ice have disappeared, and the pace of sea level rise is accelerating. According to the Intergovernmental Panel on Climate Change, with all that ice melt sea levels could rise 10 to 23 inches by 2100. And then there’s the weather itself. There’s growing evidence that global warming is causing hurricanes that are more intense; dangerous heat waves; heavier rainfall and more frequent flooding; and increased conditions, such as more severe and longer-lasting droughts, that threaten our food supply and make wildfires more frequent and severe. 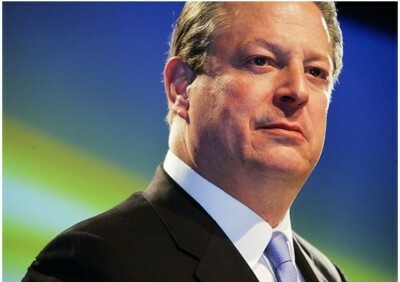 While the data continue to confirm the reality of the climate threat, Gore has been traveling the globe trying to educate and convince a reluctant, disbelieving world of the necessity to wean away from carbon fuels and to switch to clean, renewable energy sources. Gore and climate scientists across the globe desperately want us to understand that only a large-scale switch to renewables will give the world a fighting change to stabilize the levels of CO2 and other greenhouse gases. Converting sunshine into usable electricity has become cheaper more rapidly than anyone expected. In 79 countries, the cost of electricity from photovoltaic solar cells is now equal to or less than the cost of electricity from other sources. In 2000, the projection was that the world would be installing one gigawatt of new solar electricity per year by 2010. In 2010 the number was 17 gigawatts per year. In 2013 the number was 39 gigawatts per year, and in 2014 projections are for 55 gigawatts. As costs continue to decline, by 2020 more than 80% of the world will live in places where solar-generated power is competitive with other energy sources. In 2012 49% of new generating capacity in the U.S. came from renewables. Since 2009 the cost of wind energy in the U.S. has dropped by 43%. In the past four years 166 coal-fired electricity generating plants have closed or announced their closing. 183 proposed new coal plants in the U.S. have been canceled since 2005. Currently, there’s an ongoing shift from the central-station utility grid that had its origins in the 1880s to a widely distributed model characterized by rooftop solar cells and on-site grid-battery storage and microgrids. Photovoltaic electricity is displacing carbon-based energy in two of the world’s most densely populated countries—India and Bangladesh. And Gore even finds a glimmer of hope in the behind-the-scenes discussions of the financial fat cats and the recommendations of market analysts. Barclays recently downgraded the U.S. electric sector as a result of increased distributed electric generation. Citigroup is warning investors that the assumption that fracked shale gas will be the primary alternative to coal may be a false assumption. Other financial analysts are warning that fracked gas will fall victim to the decline in the cost of solar- and wind-powered generation. Large investors are divesting from carbon-intensive assets and diversifying their portfolios to include significant investments in renewables.